We’re really excited to introduce our newest Fresh Off the Grid contributor: Emily Hlavac Green. 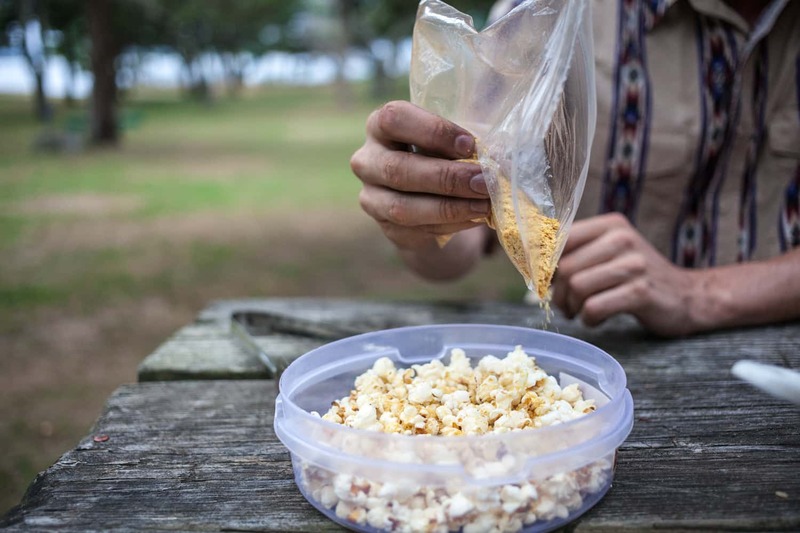 Drawing from her childhood, she shares with us her revamped version of campfire popcorn. A tasty treat to make before dinner, this is a great snack to compliment your evening outdoors. 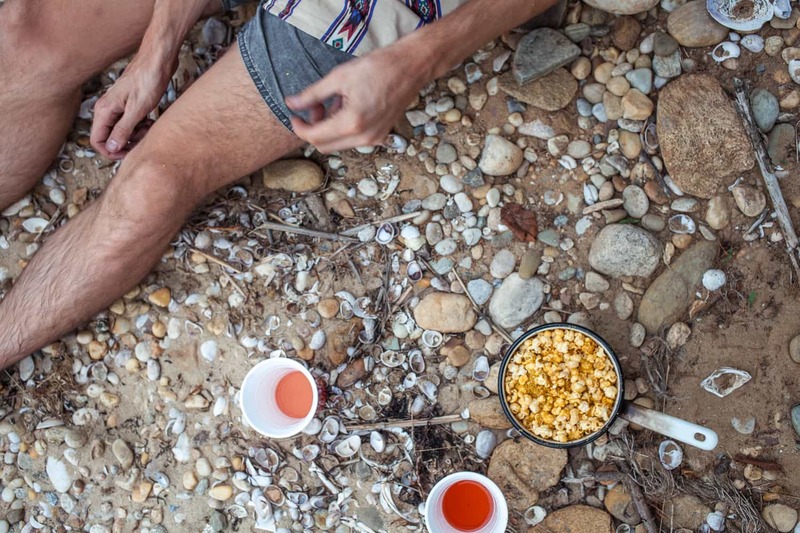 Pull up a camp chair, make yourself a bowl of this popcorn, and watch the sunset. 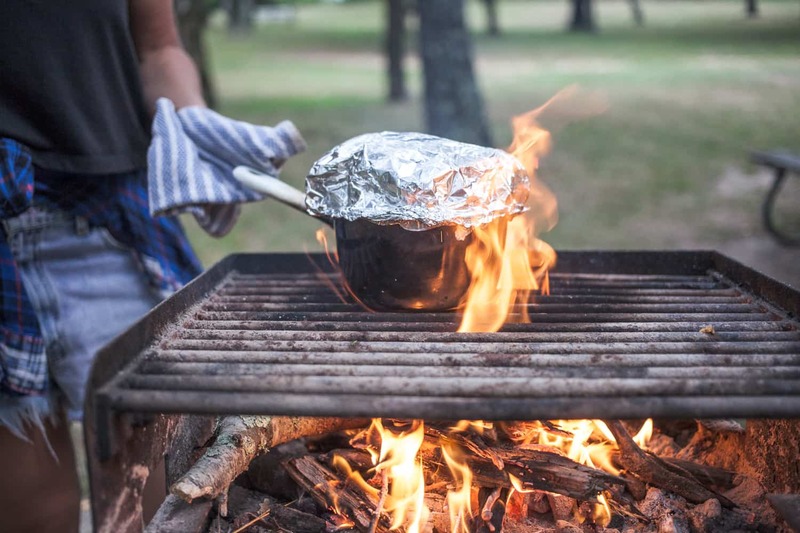 Think spicy, cheesy and smoky little puffs of flavour perfect for kicking back in a camp chair and watching the big outdoor movie that is the night sky. 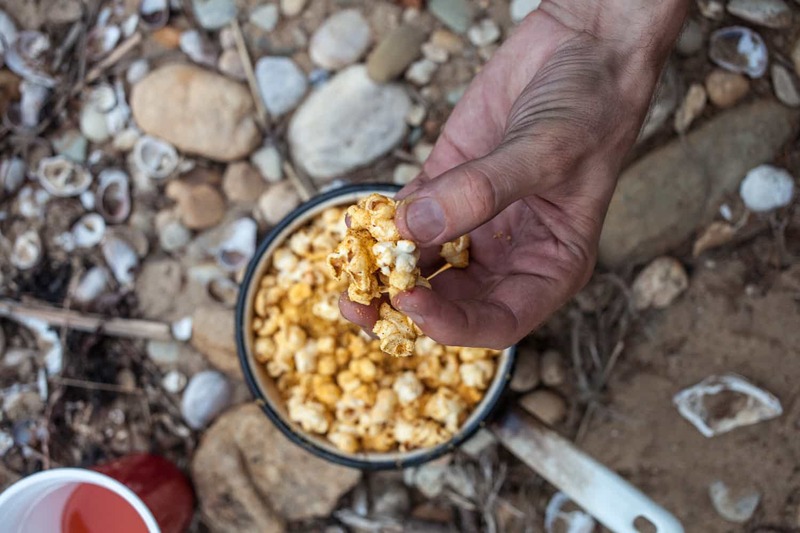 I’ve always loved popcorn and grew up on that classic basic butter-salt combination, and sometimes was allowed that bright yellow stuff you spill all over your seat at the movie theatre. I still remember licking fingers that were dusted in a yellow coating. These days it’s so easy to buy microwavable popcorn loaded with artificial buttery stuff, or pre-popped bags with a powder resembling cheese. 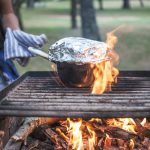 This recipe throws it back to the old school method of using a pot to pop your kernels which is pretty much a fun game in itself. Not only that, but the combination of nutritional yeast, paprika, chili and garlic salt make it a delicious, healthy alternative which can be thrown in a ziplock bag ahead of time. Put nutritional yeast, smoked paprika, garlic salt, chilli flakes, salt & pepper into a Ziplock Bag, seal and shake - this is good to go. Heat 2 tablespoons of olive oil and popcorn kernels over a mid- hot fire in a pot that is large enough for kernels to be in a single layer. 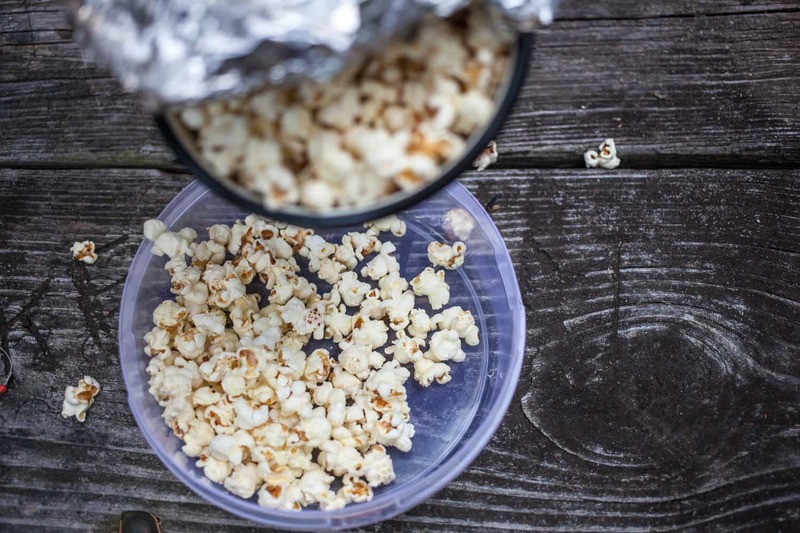 Cover pot with a lid (or use aluminum foil as we did to create a “bubble” for popcorn to pop! 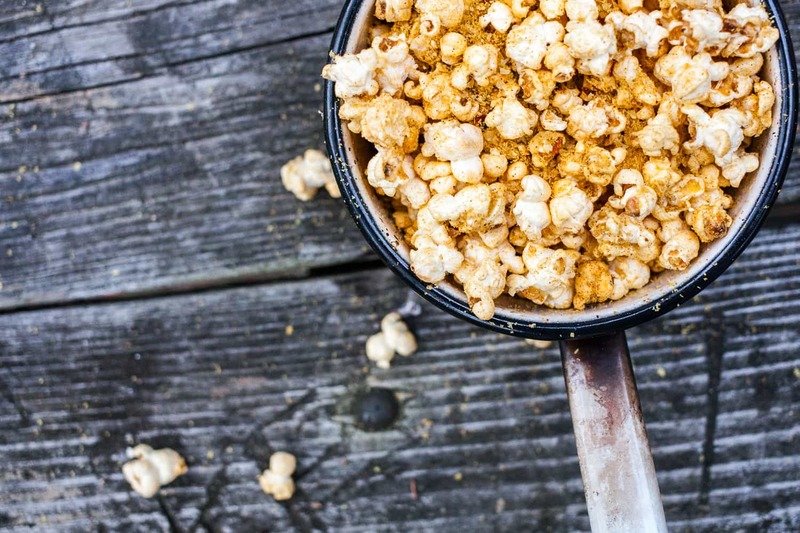 Once kernels begin to pop, gently shake the pot by moving it back and forth until the popping slows to about 5 seconds between pops. 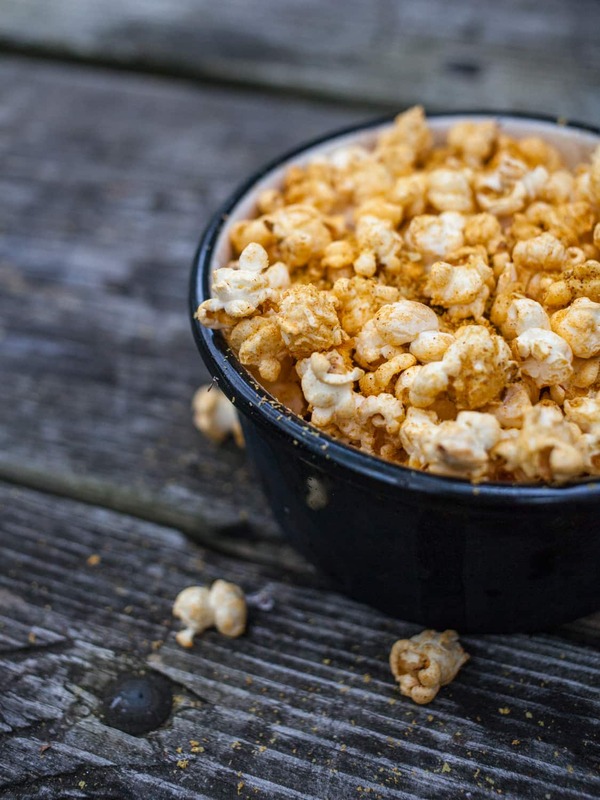 Remove from fire and drizzle popcorn with remaining olive oil and toss with nutritional yeast, smoked paprika mix. Enjoy on the beach, in a camper, or pop into a tupperware or bag for tomorrow’s hike! Great job guys. Looks like you are having great time out in the nature. I love this post! I have to try popcorn this way, I have always been a fan myself of old school popcorn using a pot and everything.